I mean, it's not that the above isn't an interesting explanation, but this seems like less of real life and more of fun life. 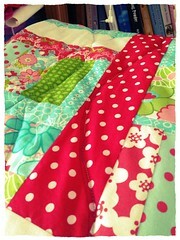 Making : A new quilt for snuggling on the couch with. Cooking : Banana cake, loaves of bread, yoghurt. Drinking : Moccona instant coffee with a dash of cinnamon. Don't hate me coz I love instant. Reading: Freakonomics by Steven Levin. 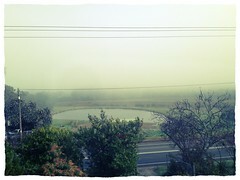 Looking: Out the window at the icy mist. 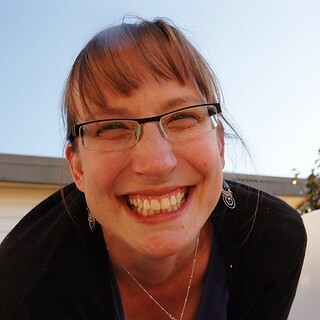 Playing: Anything on Qello.com, or the new Deborah Conway album, Stories of Ghosts. Wasting: Half eaten toddler meals. Sewing: A giant pile of paid mending. Turns out men are hard on their work shorts. Wishing: I went to bed earlier than staying up with Mr S and watching The Cleveland Show. 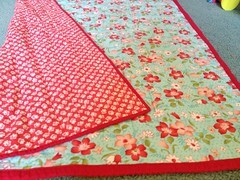 Enjoying: Thinking about my next quilt. Waiting: To finally finish my tax return. Liking: The freezerload of bananas, just waiting to be turned into cake. Wondering: Which load of washing to do first. 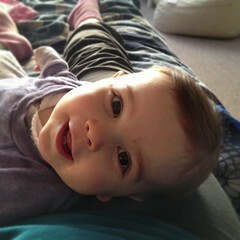 Loving: Pippa's sounds, words and giant sized smile. And the giant full faced raspberries she's currently giving the ottoman. Hoping: She decides to sleep soon. Marvelling: At making two humans. Seriously? Smash some genes together and... humans. Weird. Needing: To put the little bits and pieces of the lounge room away where they belong. Wearing: This isn't a good look today - giant sized trackies, explorer socks, a nice red shirt with a nice cardigan over the top. Half ready to leave the house. Following: Through on projects is my downfall when I'm this tired and forgetful. Noticing: The birds that seem to live in my roof are getting much bigger, ergo louder. Knowing: Like Stacey, that this isn't forever. I will sleep again and my children will not throw tantrums. Thinking: About how Pippa's escalated from giant smiles and raspberries to giant tantrums and yelling in the space of a paragraph. Feeling: Tired. Happy and satisfied after sewing class last night, and spending time with Mr S drinking hot chocolates and watching Cleveland... but so very tired. 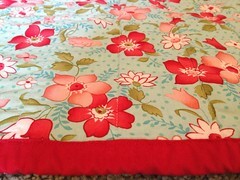 Bookmarking: Red Pepper Quilts and Ms Midge. Opening: Post that tells me I need to send this letter to my health fun and an electricity bill that wasn't nearly as scary as I imagined. Giggling: This is so freakin true. Feeling: That my headache might not go away today. Aaargh! Not only do I think I am the most fashion-boring person in the world right now, I'm worried I'll fall asleep midsentence. FFS. And to make myself stay awake, I just. keep. talking. FFS. I've been spending so many nights sitting up holding Lady Pippa that I now enjoy watching TV at 4am. FFS. I have a severe case of the Social Mummy Pretendies , that is, trying to sound like I'm not an overtired not-quite-sane Mummy. I'm convinced that half of my new Mother's Group hate me. FFS. I'm sure they don't. Maybe? FFS. I'm attempting to lessen my sugar intake. By lessen, I mean eat sugar like a normal person. Apparently punishing one's porridge with brown sugar isn't healthy. FFS. That said, porridge with some pear and a sprinkle of brown sugar is very tasty. NO FFS. Mr S and I have been watching Prof Brian Cox's Wonders of Life series. Mr S watches it, but Prof Cox has such a soothing voice to listen I've fallen asleep every time. FFS. I go to bed to listen to sewing podcasts and fall asleep immediately. FFS. I can tell you that to sew with linen you should cut on the bias and then you... do something else. FFS. Millie is pretty much fully conversational now and she's such a joy to talk to. The only issue if that if she's not talking to you, she's talking to Pippa, her dolls, her cars, Pippa, the birds on the roof... It's very freakin noisy in my house. FFS. She's cute (and she sleeps). I'll keep her. No more retaining wall waterfall. I was made redundant from my job at the end of the financial year. Quite strange, really, but it saved me from making a decision I'd been putting off for almost a year. I kept extending my unpaid leave because I wasn't ready to think about it. It's strange to not have a job for the first time in five years. At the same time it doesn't really feel real, because I haven't been to work for 10 months now. But it's still weird. FFS. The amount of times my children have been sick this year I barely would have been able to go to work anyway. FFS. Nothing says reliable employee like needing lots of sick leave for your kids. FFS. So I guess it's a good thing I'm a SAHM now. But some days I really miss the drive to work (alone), the drive home (alone), the spare half hour to go shopping (alone). I miss the challenges of my job, but I don't miss the inevitable office drama. I think I just miss being alone. FFS. The good news is that the girls are glorious. As I type this, Pip's standing up at the television table watching the screensaver on Apple TV and swivelling the volume knob (note to self, check volume). Millie is turning into a stellar little lady who loves to share and cares so very much about her family. We're all 'bestens'. I love them all so much. Not a particularly triumphant return to FFS, I know, but I've got Peekaboo to play and washing to hang up. My life is glam. 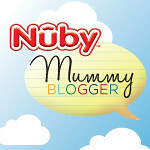 A while back I was contacted by Nuby Australia and asked if I'd be interesting in joining their team of bloggers - a Mummy Blogger if you will. They offered to send Family Smyth some of their new products to test, review and giveaway here. First up is the Rhythm Bottle, with additional teats and disposable liners. Curious. I'd seen these advertised and wondered both what they'd be like to use and what the actual point was. There's a better explanation of bottle usage over on their website but essentially it's a sterilised liner that fits in the purpose-built reusable bottle and reduces air in the milk filled liner, thus reducing air intake by your littlie, thus reducing colic. Child and toddler paraphernalia not strategically placed. Lady Pippa has the odd bottle every now and then, and has always suffered with colic and gas. Whilst she latches well she doesn't need to work particularly hard to breastfeed and is a bit 'relaxed' slack about the whole affair, so I was keen to try the bottle system for one of her bottle feeds. 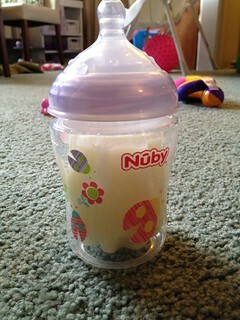 The bottle is supplied with one newborn sized teat, so Nuby also sent a packet of 3+ month teats to fit the bottle. There are notches in the sides of the teat to help you align it in the bottle top and there are air intake holes in the teat itself. Pip do it on her nown. To use the liners and bottle system you assemble the liner within the bottle, warm the feed seperately and then pour into the liner. With the bottle top and teat on, you push the bottle of the liner upward within the bottle, essentially pushing the air out of the liner through the teat, making it somewhat airtight. Feedwise, the Rhythm bottle system works just like a regular bottle. As the bottle is emptied, the liner collapses on itself. Several comparisons sprang to mind, but, well, I'll leave that one well alone. 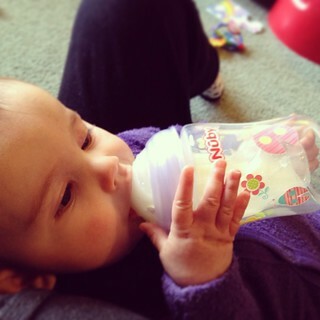 Pippa enjoyed being able to hold the bottle herself whilst we fed and I found the bottle quite easy to hold. I did have trouble with a bit of leakage through the air intake holes, and I'm not entirely sure how to get around it. The liners are sterilised, so if you are formula feeding and needing sterilised bottles these would be ace for on the go. Pip did not have as much gas after the feed, and I do think that the liners reduce air in the feed. Win! 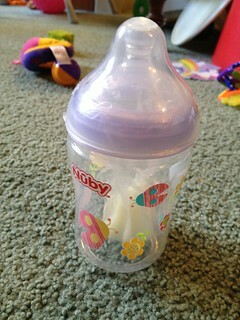 It's easy to assemble and far less daunting (for me) to have to think about sterilising bottles and teats. I've never formula fed under 6 months before so I've not needed to worry about sterilising bottles and teats for breastmilk. There was a bit of leakage through the top of the bottle, so that would be cumbersome if you were feeding like this every day, but perhaps you'd find out how to fix that. I don't like the disposable nature of the system. I think it's a great idea for now and then, but unless you had a baby who had severe colic I don't agree with throwing away liners for every feed. Cost. The bottles, teats and liners are relatively inexpensive, but at approx $7 per box of 50 liners, it could wind up being pricey if you fed with this system full time. I really liked the system. I wish I'd had it for my first baby Millie, who had weeks of colic and gas in her early days. I love the disposable liner system for travelling - I'll be taking them with me when we travel interstate this month. What do you think? Would you try the Nuby Rhythm Feeding system? 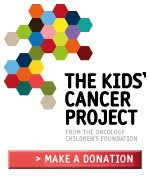 *Products were supplied to me by Nuby Australia for the purposes of review on my website. No payment was offered or accepted. All opinions are my own. *Unless you are me and even though you have an extensive list to shop with, there is inevitably a few things that slip my mind. Usually the glaringly freakin' obvious things, like bread. It's the enjoyment of shopping online, with the smugness that comes from knowing you will need to venture to The Supermarket, but it's a duck in and out job, not a packed lunchbox kind of affair. I started doing my groceries online a few months ago when my lovely pregnancy hormones vacated and left my mental health somewhat lacking. Along with seeing my GP, I started to find any little ways to make life easier. Strangely enough, the prospect of not taking an infant and a toddler to the supermarket made me feel like my life could be easier. What now? You're charging a premium per item and in delivery that means I can't buy my BBQ sauce online because someone in New Town might want to buy it? Yes. I could. But, genius, that isn't why I'm doing my shopping online now, isn't it? When I leave detailed notes in the 'Detailed Notes for This Item' section, I also have an expectation that my personal shopper whom I'm paying more from might actually read it, not completely ignore it. So I tried The Other Supermarket from Another Town. And grocery toting angels sang from on high. My groceries are delivered to my kitchen bench. I can pay by EFTPOS in my kitchen, should I choose. The delivery is half the price of The Supermarket, and we're actually spending less on our groceries because I'm not wandering aimlessly distracted by shiny things for some unknown reason. My delivery person will even take the plastic bags away to be recycled. My one beef is the sheer amount of plastic bags used - they have no other option unfortunately, but last week I received one zucchini in a clear veggie bag in a shopping bag. One. The other first world bonus of doing my shopping at The Other Supermarket is that because we've never shopped there, their home brand goods are like another fancy brand that we haven't tried yet. I've so far whittled us down to Other Supermarket Corn Flakes, Other Supermarket Pasta, Other Supermarket Lemonade... as I clicked through this week's shop I hopefully said to Mr S 'What about Other Supermarket Ice Cream?'. I did not buy the Other Supermarket Ice Cream. Clothes. THEY ALSO SELL CLOTHES. I bought P a pair of socks to test the Clothes At A Supermarket quality, and they're not only lovely, they are highly reasonably priced. So once a week I write my list, I sit down and click my grocery shopping into the ether of the internet. As if by magic, two days later it turns up in my kitchen. MAGIC, I tell you. This is absolutely not sponsored. It would be brilliant if it was. Dear Internets, it's not you. It's me. I've lost interest in the Twitter, and Facebook seems to never refresh fast enough for me. I deleted Twitter off my phone a month or so back, and I haven't missed it. I find it's a medium that requires you to be in constant contact, or none of it makes sense. Cuddles. More cuddles. Building blocks. Sewing. Cleaning the house. Oddly enough, quite enjoying cleaning the house. Teaching Millie how to use the kitchen. Watching Pippa roll over for the first time. Listening to Pippa's baby chats. Teaching Millie how to say 'Love'. ('Lub') Hanging with Mr S.
The first year of a baby's life is hard for the parents. I've said this before. It's a year of feeding feeding feeding, sleep deprivation, a lot of infant bodily functions with tiny glimmers of awesomeness. This time, I know this, so I enjoy the awesome (baby cuddles and chats) and attempt to ride through the yucky (Pippa's colicky refluxy screaming for an hour at a time). I've had my brush with Baby Blues this time, and once I stopped the Mini Pill I slowly returned to normal. There were four weeks where I just couldn't stop crying. It was awful. I must say that thankfully there was no "pane of glass" between me and my babies, I just couldn't stop crying, then I'd cry more because it was so ridiculous. So, to the Dr that refused to prescribe meds and told me ride it out another week, thank you. I spent a long time weaning off meds years ago, and I don't want to do that again. I've been SEWING again. I say it with caps, because it makes me so happy. Sorry, SO HAPPY. Millie pulls a chair up to the ironing board (at the non-burny end) and chats to me while I'm sewing. 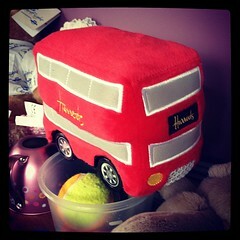 This week she chose two kinds of fabric for 'Millie's Bag, Mum?'. I can't refuse that - and she was SO happy. I'm thankful for Lady Pippa who is really quite a laid back kind of gal, she fell asleep in her bouncer today whilst we moved all the furniture around for a pest spray, and then slept right through it. Bless. Her eyes? Oh my goodness. I could look at them forever. No pics here today, you'll have to use your best imagination photos. Why no pics? I've been busy, Internets. Busy cuddling my babies. I'm pretty pleased with myself. For the last 11 days I've completed my recovery stretches twice per day, with the exception of Sunday. On Saturday night Mr S was away, Pipster woke me at 4, we dozed until 5, and at 5.30am she chucked all through my bed. GOOD MORNING! So, on Sunday I struggled with 4 hours sleep. 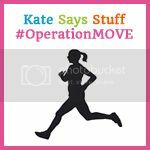 I've found that I no longer wobble on the spot when I'm standing still, my abdominal muscles feel much stronger and I have got hamstring strength. All this in 11 days? I'm impressed. When I put some new batteries in our scales on Tuesday and realised that I've lost 15kg since Pip was born, I was happy. I'm going to continue with the stretches and start doing some cardio next week as well. Last week I pulled out my pre-pregnancy clothes and it was not the shopping extravaganza I had hoped for. I'll be rocking my maternity jeans for a few weeks more.